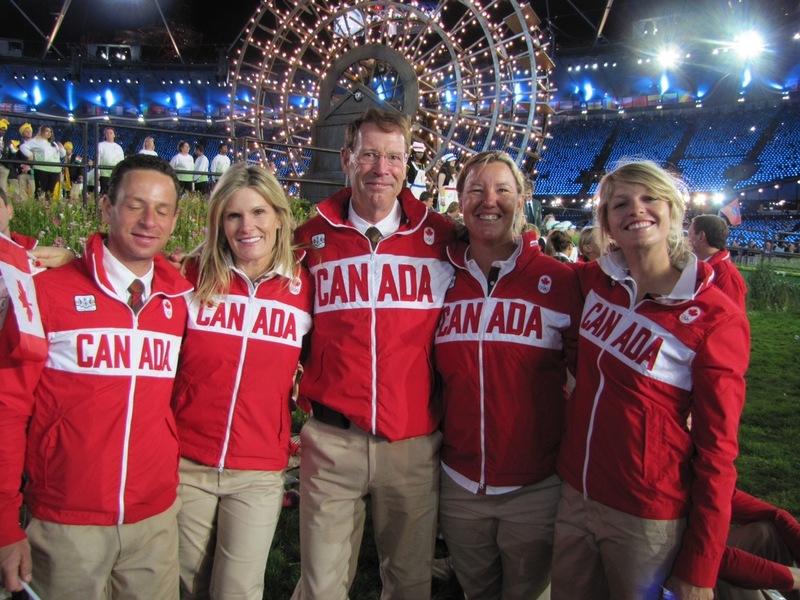 We had 5 athletes walk in the Opening Ceremonies: Ashley Holzer, Jacquie Brooks, David Marcus, Tiffany Foster and Ian Millar. It took a bit of coordinating, which caused me stress during the day as I wanted to make sure that everything was good for the athletes. Jacquie and David had their ceremony pants at the Village (they had to be altered), so wanted to make sure they knew where to go to get their pants. Tiffany was coming in by train from Belgium, and Ian was coming in from the Jumper training camp in Newbury. The Jumpers haven’t done their Outfitting yet, so everything had to be timed so that Tiffany & Ian could come to the hotel to try on their clothes before we headed to the Olympic Village. And to make sure that we had some exchange options, Tina dragged all of the Jumper Grooms & Support Staff duffel bags up to our hotel room. As luck would have it, all of Tiffany’s clothes fit her (phew!! ), but Ian’s shirt & pants were too big so we dug through the other bags to see if we could find some smaller sizes. After a bit of panic, success!! We managed to grab a quick bite at the hotel, then set off on the DLR for the Olympic Village. The train ride was surprisingly quiet – -I wasn’t sure if it would be packed so I had planned for a few extra minutes just in case. 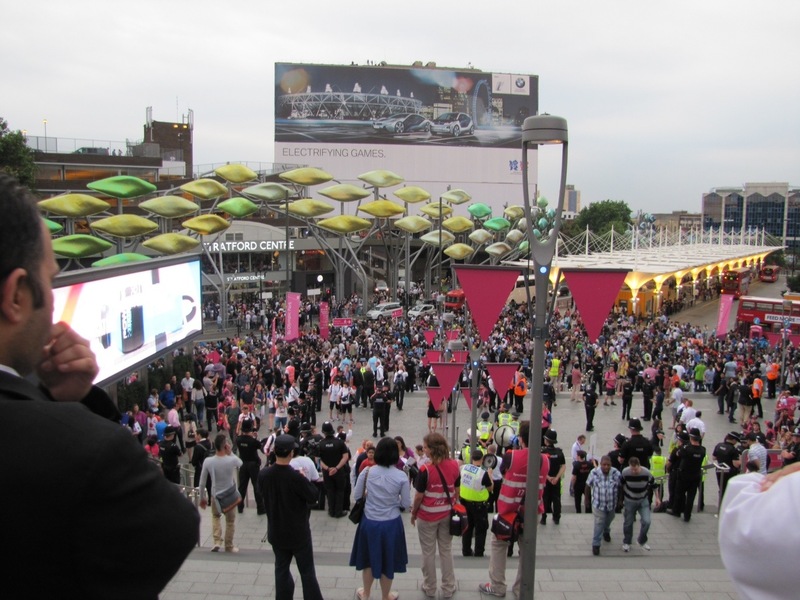 When we arrived at Stratford Station, the crowds then appeared. Exciting! 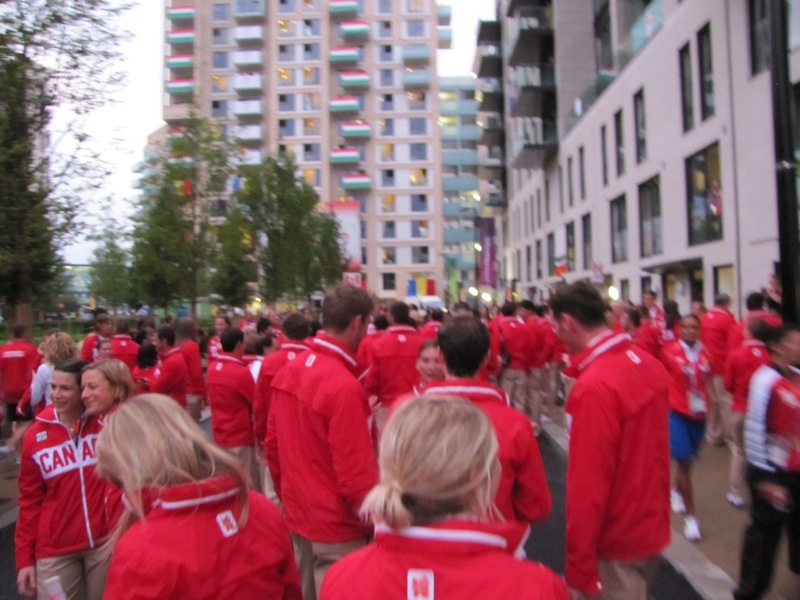 We then made our way through the crowds to the Olympic Village. 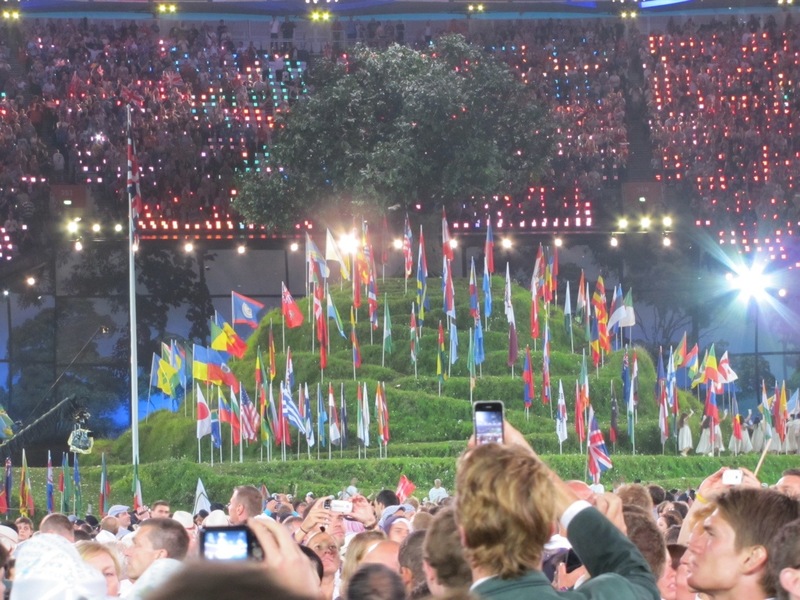 It was definitely fun to see all the people heading towards Olympic Stadium for the ceremonies. My job was to deliver Tiffany & Ian to the Canada residence building at 8:15pm, and we arrived at 8:05pm. Result! I even had time to make sure that Jacquie’s and David’s pants were waiting for them at Team Services. 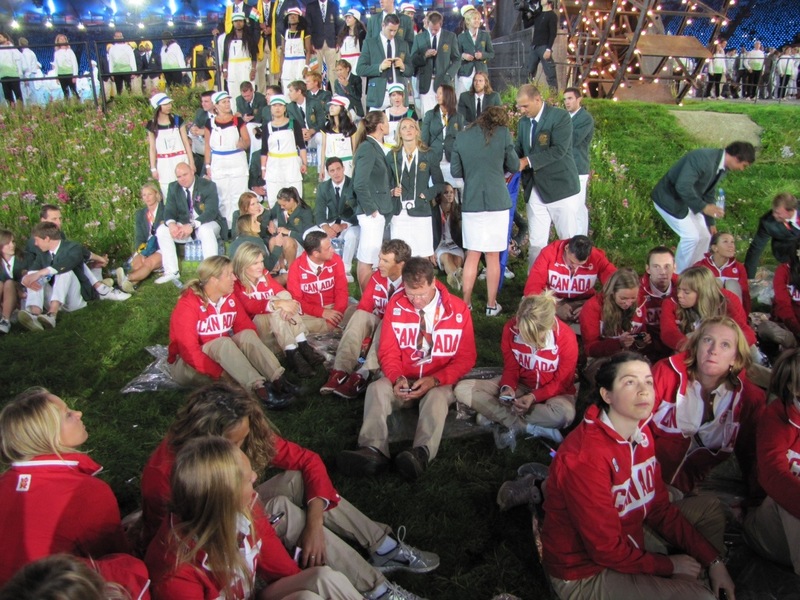 Even better result, a few minutes later the Dressage athletes arrived and had time to change their pants! 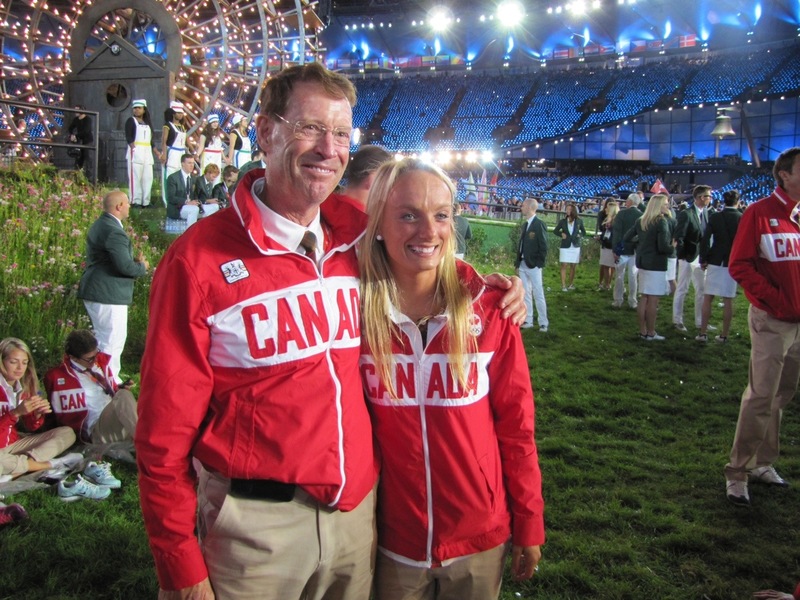 Mark Tewskbury & Sylvie Bernier (Chef de Mission and Asst. 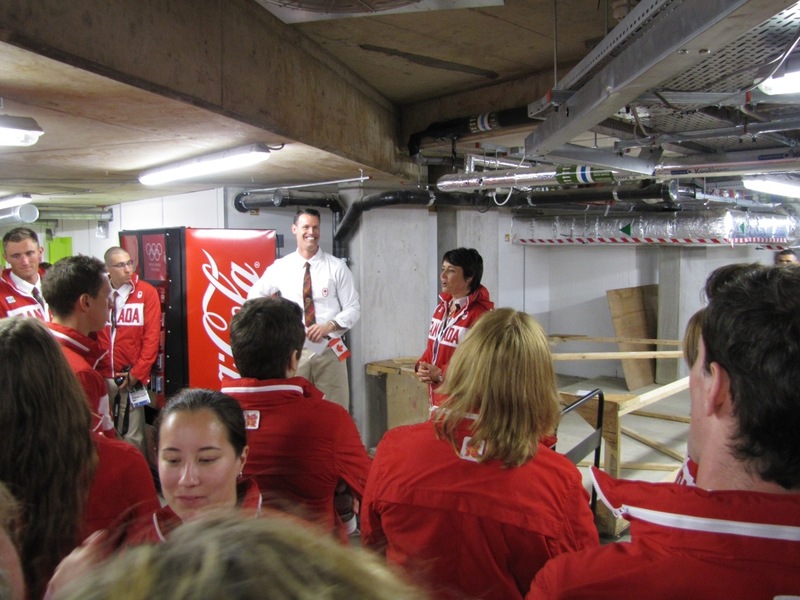 Chef de Mission) then gathered all of the Canadians for a rousing pep talk. Mark reminded everyone that a competition like the Olympic Games is a collection of great highs, but also can have great lows….so prepare and embrace for both. He also recounted a funny (although morbid!) 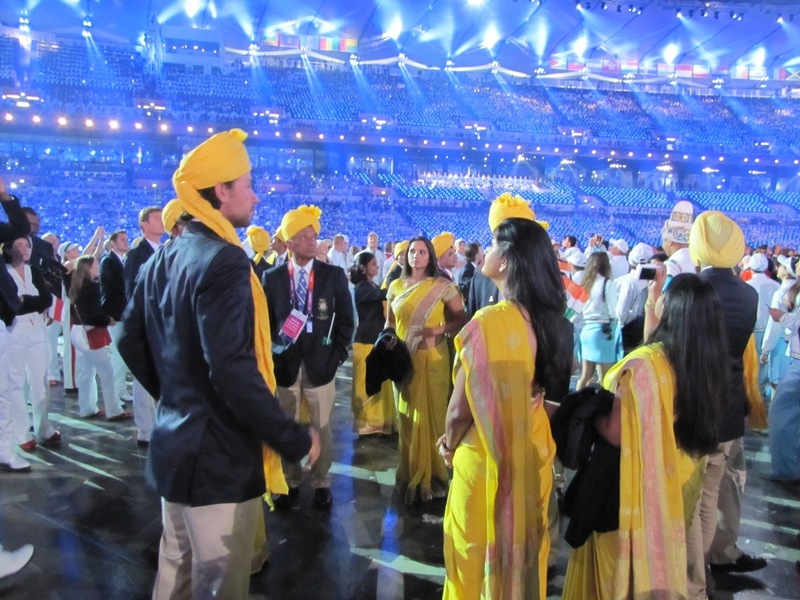 story to prepare us for what can go wrong at the Opening Ceremonies despite everyone’s best efforts. 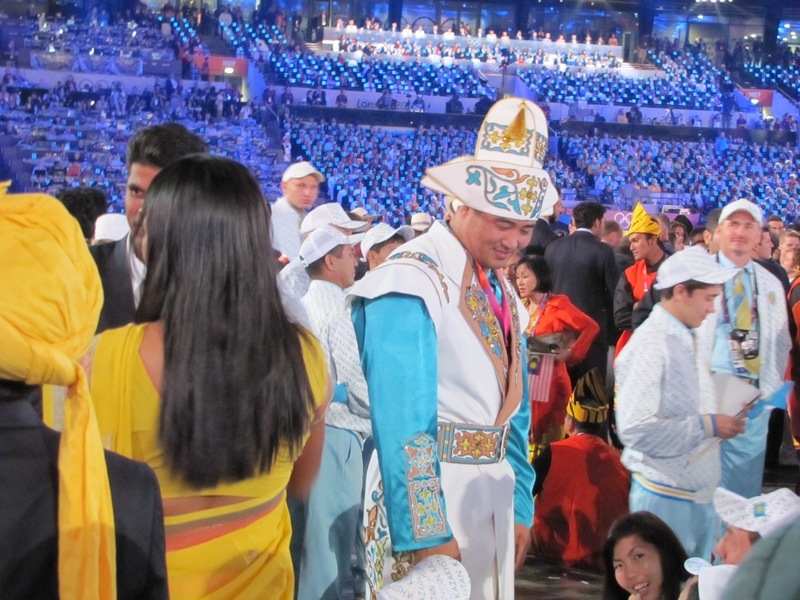 Mark’s first Olympics was 1988 Seoul, Korea, and for the Opening Ceremonies the organizers had 200+ white doves to symbolize peace. They released the doves prior to the lighting of the torch, and Mark said it was quite a moving moment as the doves soared then settled to perch on railings, the cauldron etc. 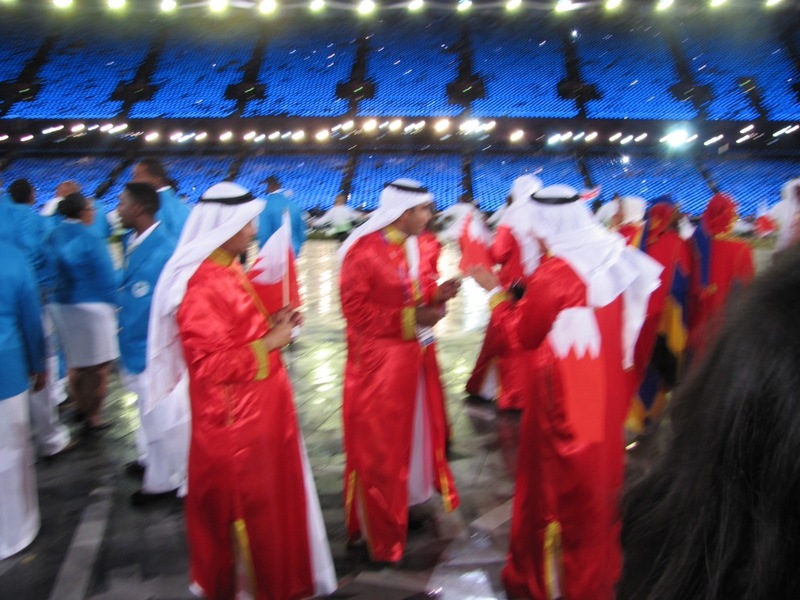 Moving in a different way was when the torch came into the stadium, and the cauldron was lit……and burning doves started to fall from the sky. Thankfully nothing like that happened here! 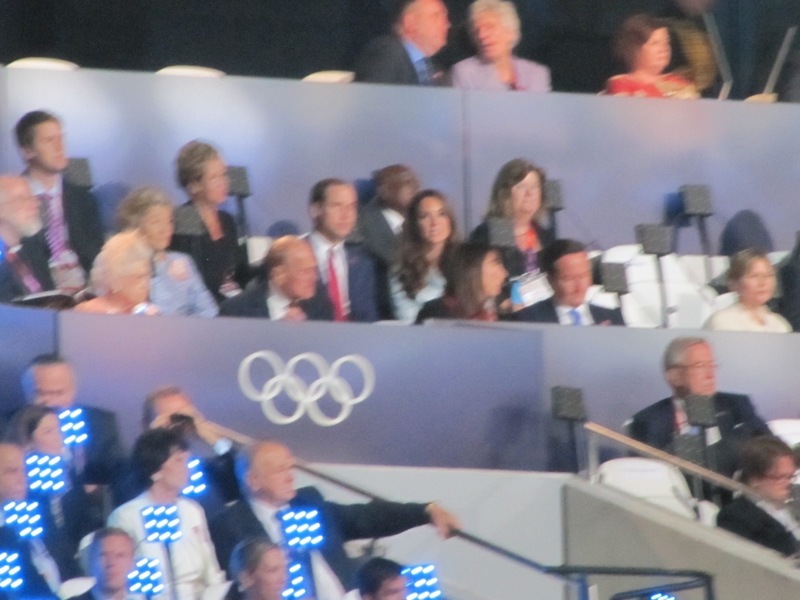 What was really nice is that Mark explained they were arranging the marching formation to have the first row of 8 with past Olympians. 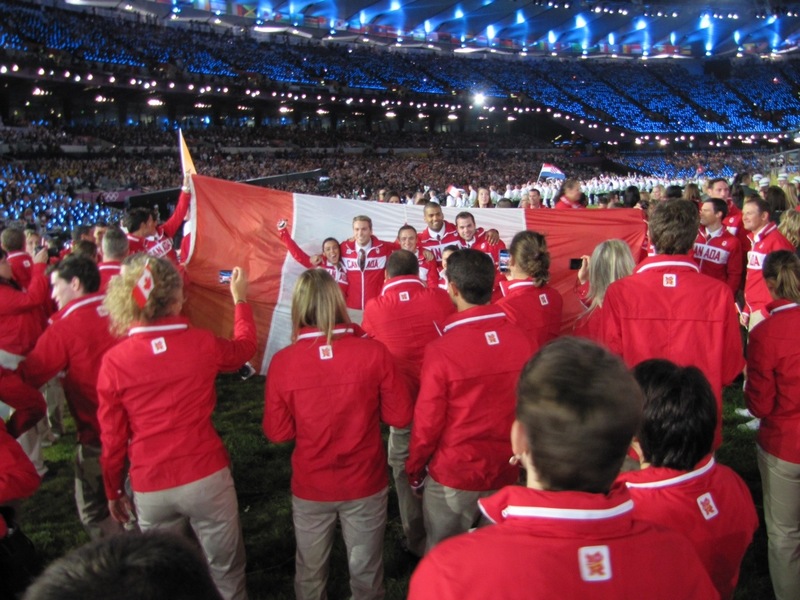 As Mark put it, since the 2012 Canadian team is comprised of over 64% rookies, COC wanted to have the veterans lead the team in. 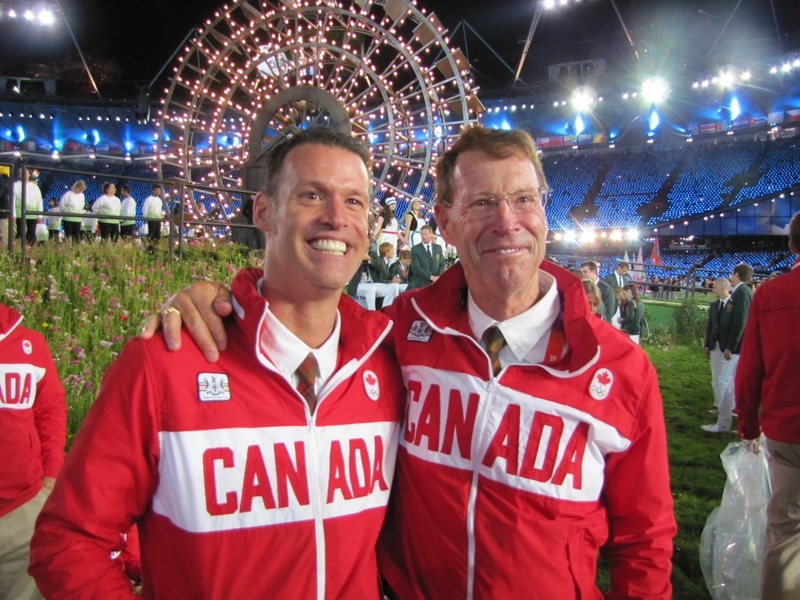 Mark then introduced all of the Olympians and you should have heard the chatter amongst the athletes when Mark introduced 10-time record holder Ian Millar – whoohoo!!!!! After the pep talk, we then started off on the march out of the village. Lining the route were schoolkids who went crazy when they saw Canada! 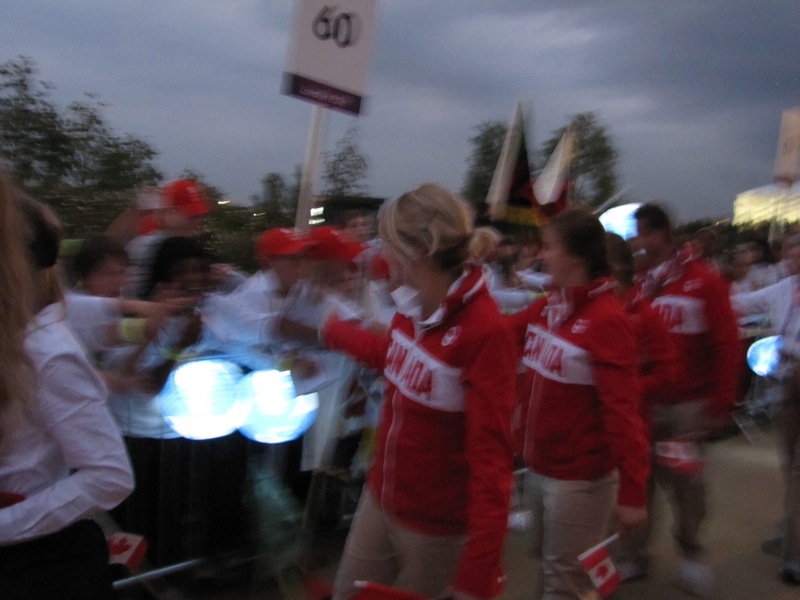 Many of the athletes stopped to sign autographs, or run along and high-five their outstretched hands. 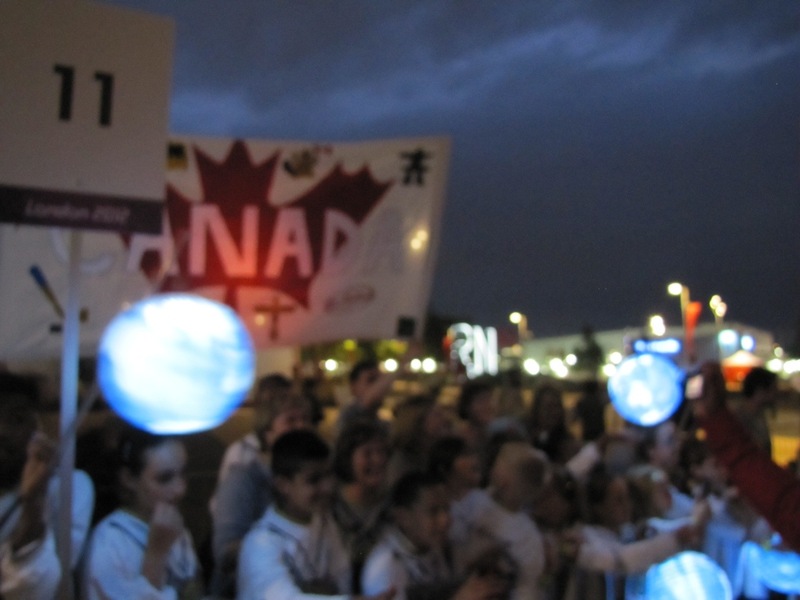 There is definitely LOTS of love for Canada here! Taking a pic of the army taking an pic of us. 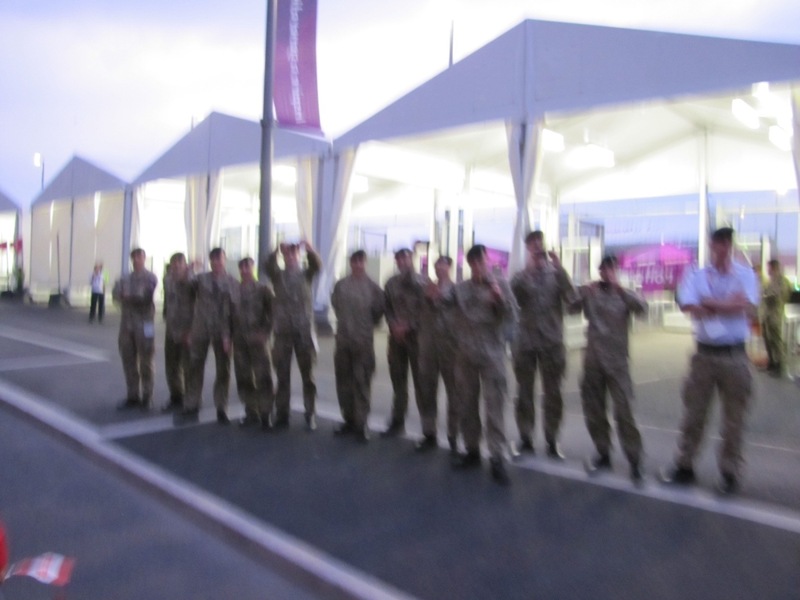 Have I mentioned yet how friendly the British army are?? They do all of the security at Greenwich Park, and they are so happy to see Canadians! I’ve already made a deal with one army girl….I will trade her one of the fancy Canadian pins and she will buy me a bag of Minstrels chocolate (my fave). Getting closer! 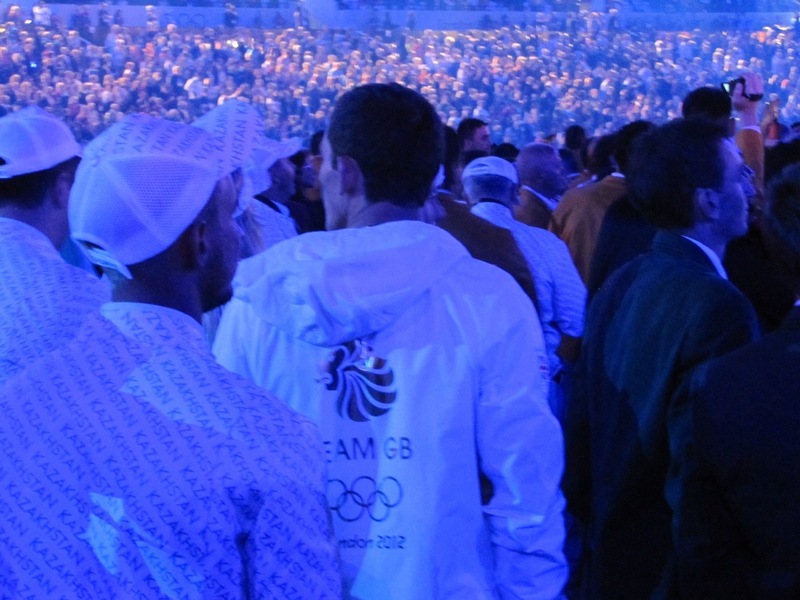 You can see Ian Millar & flagbearer Simon Whitfield in this shot. We’re in! This is the holding area in the centre after our march into the stadium. 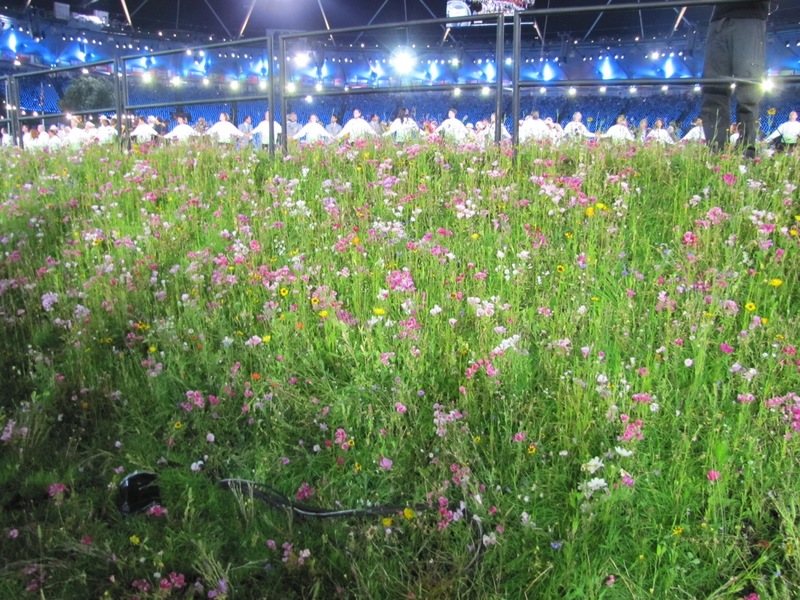 those are real meadowland flowers!! 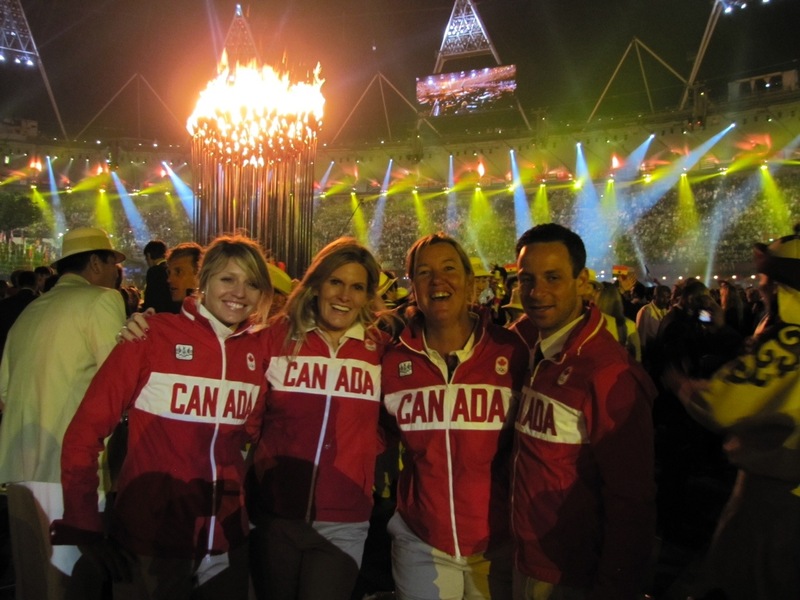 Tiffany, David, Ashley and Jacquie by the Olympic flame. As you can see from this small selection of photos, it was a brilliant night. We were on our feet from about 7:30pm – 2:30am, so needless to say I was a cripple by the end of it (and well into the next day!) but so totally worth it. Ian was a total rockstar during the ceremonies…all of the Canadian Olympians wanted their photo with him and Ian was so accommodating, and had a fun time posing for all the pics! At the end of the evening, Ian was whisked away to do an interview with CTV’s Lisa LaFlamme, which appeared on the National that night. Tiffany and I made our way back to the Village, where I dropped Tiffany off at the Athletes Dining Hall (it was packed! 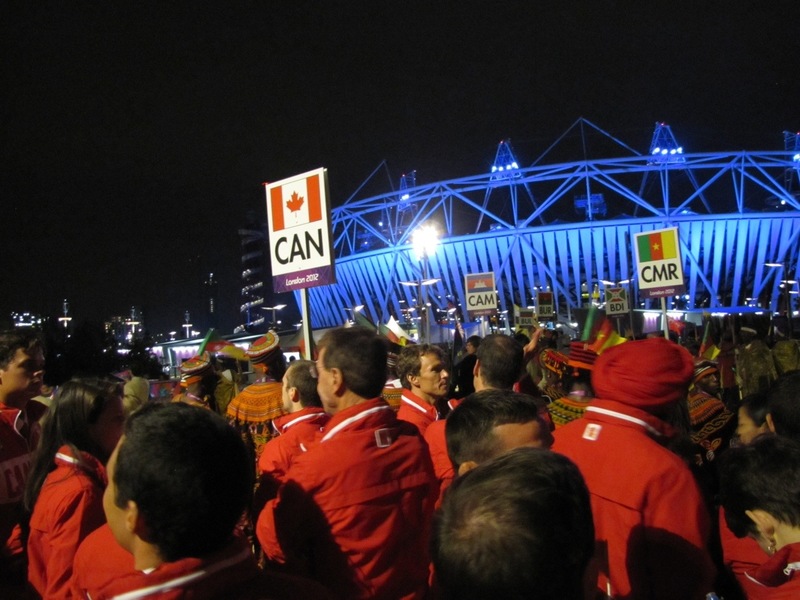 ), and I made my way back to the Canadian building. Ian and I agreed to meet at the “Moose” when he was finished with interviews so we could catch the DLR train back to Greenwich. The last train was 2:30am, so when the clock started to creep up to 2am, my anxiety started to rise when there was still no sign of Ian. Our dressage gang showed up, and chowed down some cereal (thanks COC!) before they rushed off to catch the Tube. We managed to get onto the training with 5 mins. to spare – Woohoo!!! A quick call to Assistant Team Leader Tina Collins confirmed that Ian’s car was there and waiting for him. 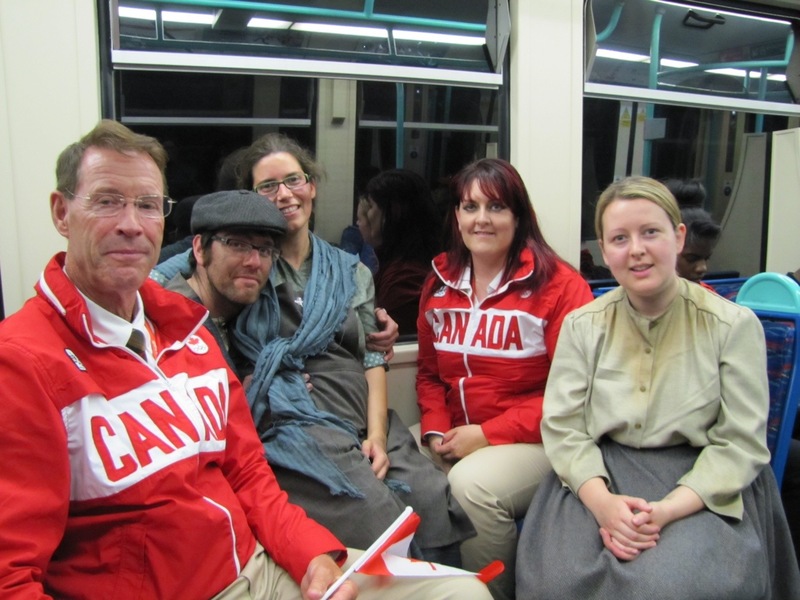 You just never know who you will meet on the train! These guys were part of the “Industrial Revolution” show in the Opening Ceremonies. And I leave you with this great shot. 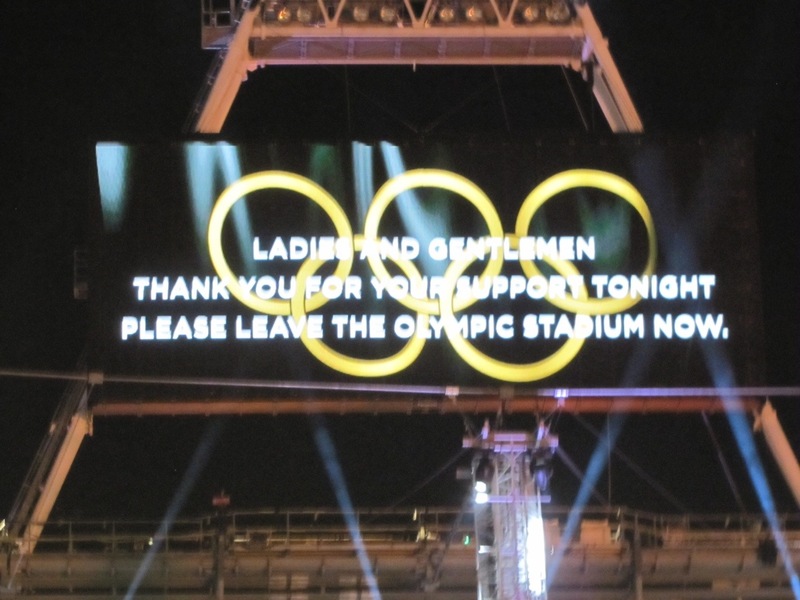 It appeared on the screen at the end of the Ceremonies. 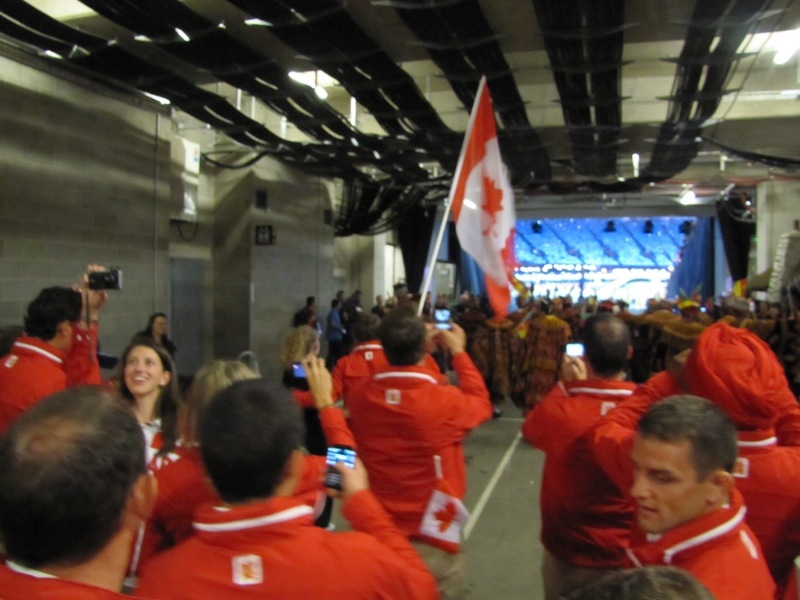 Very cool Kerri, thanks for the behind the scenes look at the ceremonies. Hope you have a blast!! 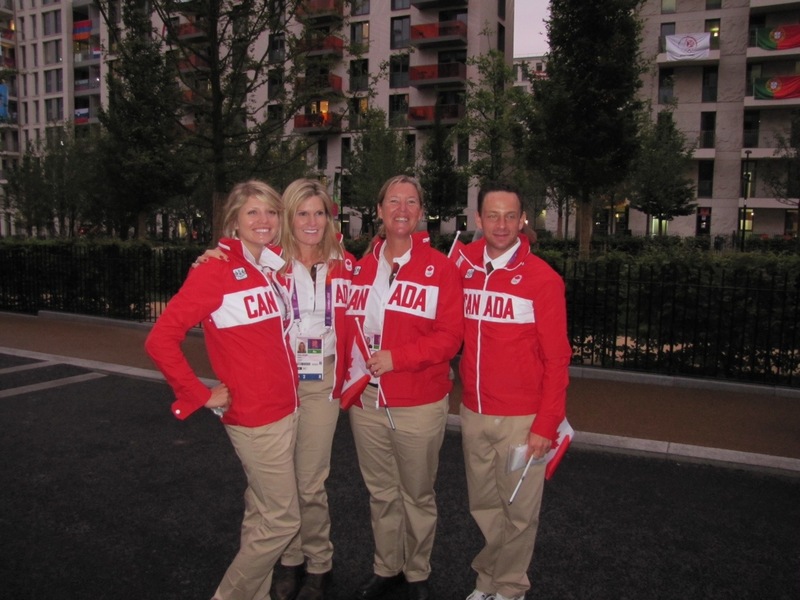 Thank you for capturing the spirit of the games for all of us back home, Kerri! I look forward to each of your posts with great anticipation.